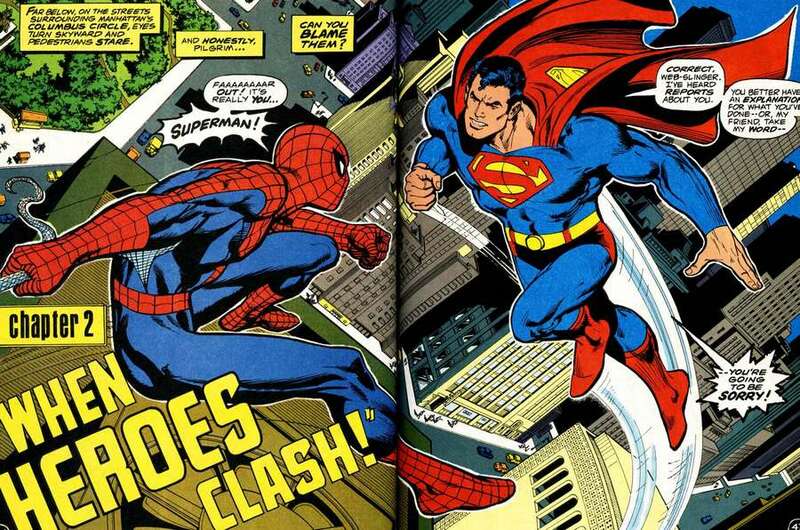 Splash pages - you gotta love 'em. A place where the penciller can hit the reader full-throttle, with a large dose of illustrated 'wow'. 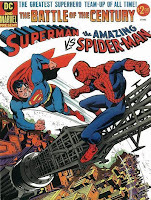 This week, it's one of those dream fanboy images from 'The Battle of The Century' Superman vs The Amazing Spider-Man, by Ross Andru. I would say excuse the fold, but when it's two of comics biggest figureheads meeting face-to-face on a giant DPS, some how I don't think you'll mind. Just look at that clean line-work too - that's the stuff of great comics! 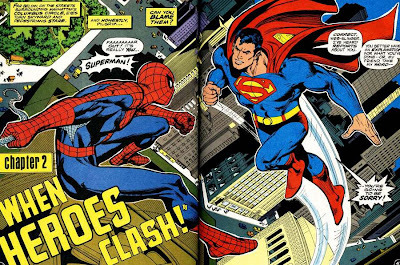 Neal Adams provided a few finishing touches to the DC folk in this one-shot and my all-time favourite Spidey artist, John Romita handled touch-ups on the Marvel side of the fence, so it truly is an iconic pairing any way you look at it. i used to see this one shot advertised in comics i read all the time back in the 80's. never actually saw a copy or read it of course. the art work looks tight. by the way Dan i ran into your comment on Jason's 80's Marvel blog about Avengers Annual 10. i used to have that issue too. that was some of Mike Golden's best work. so dynamic you could practically feel the pain from whenever rogue clobbered an Avenger. With DC reprinting Superman vs. Muhammad Ali in the treasury format later in the year, this book needs to be next! man that's too funny cause i almost mentioned the Superman vs. Muhammad Ali book in my comment as far as stuff i used to see advertised but never read. I know what you are saying about seeing ads in comics for books and never getting the chance to read them though - especially being in this little corner of the globe! @ Rob Hopefully some person at DC is already already campaigning outside Jim Lee's door to make this happen. They could also do the Batman/Hulk on as a follow-up! For all the folks wanting a good look at both treasury comics or comics you saw but never held, checkout Rob's own TreasuryComics.com - warning: it's mega-addictive!